Marc Andreessen famously coined the phrase “software is eating the world.” It’s an apt observation. If you look back on the history of computing you’re likely to measure computers sold or devices sold or users harvested or productivity gained. These things are measured because they can be measured. But the greatest cause of value created and captured has been the development of software. An ephemeral product whose value is often ignored in analytical discourse. Software is not easily measured and it’s not easily valued due to its intractable nature. Firstly, because businesses that make software tend to have weird cost structures–absurdly high fixed costs and operating margins: They operate without income for years and then suddenly are massively profitable with a minimal set of resources. They have a non-linear, “big bang” trajectory. Secondly, software companies tend to capture revenues from something other than the direct sale of the good. Software is rarely sold. Services sometimes are sold on the basis of software but more likely audiences for services are sold to a set of bidders, or revenue is obtained in even more circuitous ways. Thirdly, because there are curious multi-sided markets for software platforms. Charlie Kindel hints strongly at how difficult it is to understand the dynamics of software platforms. There is the prospect of lock-in of users and data. There are relationships to nurture with developers and there’s the principle of an ecosystem that creates network effects. The virtuous/vicious cycles are non-linear and unpredictable even for the experts who have been at it for decades (e.g. Microsoft). Given these difficulties, software is seldom seen as the core value proposition for a particular business. But make no mistake about it, Apple, Google, Microsoft, Facebook and Amazon are all software companies. They “monetize” or integrate software differently but software is causal to their profits. Their use of software has also made them all disruptive. Software enabled the disruption of consumer electronics, retail, computers, advertising and broadcast media. But we have not seen anything yet. There is another class of software that is poised to lay waste to a new set of industries. The lowly app coupled with cloud-based services is the termite that is set to eat the foundations of the largest of the industries still standing. Games. A software industry in itself, the app versions are attracting non-consumers and eventually will get good enough to absorb all usage and profits. Games merged with “entertainment” concepts will lead to new models of user recreation leading to new global brands that could challenge even Disney. TV. As apps come to the big screen TV will never be the same. Not only will show creators build directly for an audience but advertisers that currently sponsor shows will produce them instead and package the result as an app. Shopping/dining/entertainment/hospitality are changing with location services and with novel “bits to bricks” purchase options (e.g. PassBook). Increasingly services will exploit handheld devices to enable product discovery–the main job retailers are tasked with. Communications. The observation that “phone” is just an app and that messaging can be done in dozens of ways depending on message, relationship, context or even custom is possible because apps conform to the user’s needs rather than the user conforming to the tools they get from the network service provider. Although these are enormous opportunities in themselves, this is in addition to several industries that are already crumbling (photography, book publishing, to name two). I don’t need to rely on prose alone to make the point. A graph can also lend a hand. 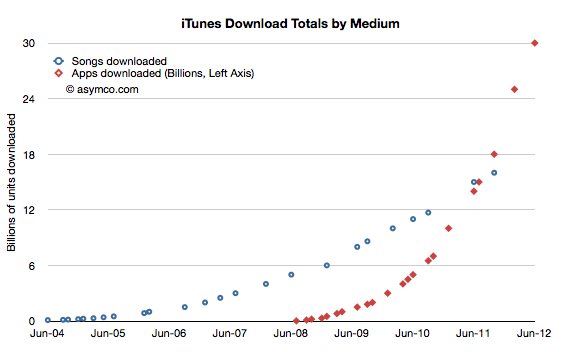 Consider that Apple’s App Store and Google Play together have had over 50 billion installs in less than four years and that the number of users of apps is at least 750 million. Furthermore, consider that apps have moved from a smartphone phenomenon to tablets and even PCs using OS X or Windows. Within one year these software capsules are going to be in use by one fourth of the global population. The world has never seen such an opportunity. The consequences are unforeseeable. Apps are a form of software that goes beyond its ancestral “application” as a product and as a business model. It’s the software that will take in and assimilate everything in sight. I have a simple rule to distinguish between an app and a service. If you have to supply a username and password to an app, it’s a service.